Such barbaric and mom based attacks under the name of radical Islam is uncivilized and HMSA strongly denounce this inhumanly terrorist act of group responsible for such horrendous action and urge U.S. government to identify and bring the perpetrators of this crime to justice. 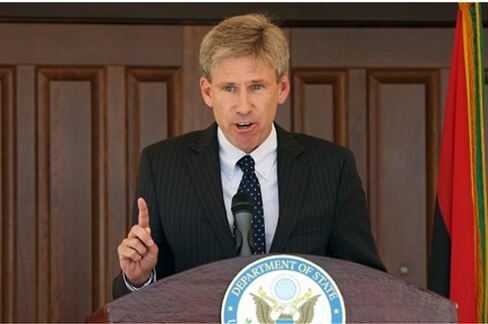 Mr. Christopher Stevens was serving U.S. Ambassador in Tripoli, Libya and had a key role in establishing peace and post Gaddafi era and was there to open an American cultural centre. Such mob based attacks by radical Islamists have become a common culture in Asia and elsewhere, this is not the first time such inhumane and deplorable crimes have been organized under the pretext of mob, recently in Mumbai on Aug 5th 2012-09-22 a huge crowd of Muslims went berserk and burned several police cars, stole police weapons, threw passengers out of running train and vandalized the Indian Army memorial. Similarly a Muslim mob went berserk recently in New Delhi and burned down Gas stations and threw stones at police and damaged property worth millions. These barbaric Islamic elements deliberately conduct such heinous act under the guard of thousands of protestors in an organized fashion to get clean hands and run away after committing crime as security agencies are not able to control mob and can’t fire indiscriminately. These inhumane Islamic terrorists are taking advantage of such a situation. HMSA offers its deepest condolences to friends and family members of Late. Mr. Christopher Stevens. 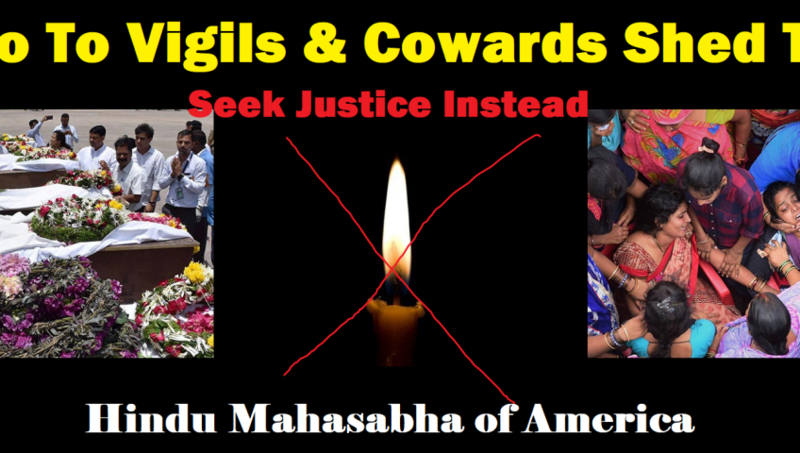 Hindu Mahasabha of America Inc.
August 6th, 2012 (Wilmington, DE) – Hindu Mahasabha of America (HMSA) (aka Hindu Congress of America) condemns the gruesome killing ofseven sikhs inWisconsin Shooting at Sikh Temple (Gurudwara) on August 5th 2012 10.30am. The investigation agencies are not sure whether the gunman misunderstood Sikhs as Muslims or was it an act of domestic terror. The way the rampage of killing at Sikh holy temple was carried out is deplorable and condemnable to every extent. Sikhism is a peaceful religion whose values promote universal brotherhood, peace and unity. The Sikh faith is the fifth-largest in the world, with more than 30 million followers. It includes belief in one God and that the goal of life is to lead an exemplary existence. There are an estimated 500,000 or more Sikhs in the United States. Sikhs are not Muslims nor do they have anything to do with Turban wearing people from Afghanistan. Whatever may be the reason – this sort of rampant cold blooded killing of people of other faiths at their hold place is very deplorable and projects the mental sickness of intolerance and ignorance. 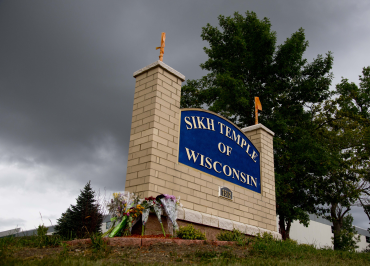 HMSA offers its deepest condolences to friends and family members of Sikhs who died during this unfortunate hate motivated incident. HMSA also request national federal and state agencies to create awareness among people about Sikhism and other non native faiths to remove ignorance which leads to wrong actions. 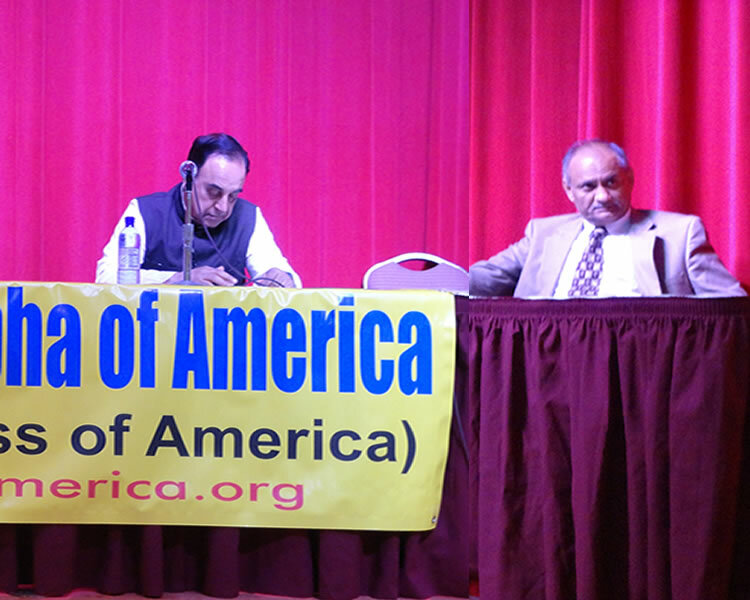 The Hindu Mahasabha of America (HMSA) welcomed Dr. Subramanian Swamy in Houston where he, in a public address, chronicled the specter of corruption in the Indian Government which stifles the economy and threatens the national security of India. 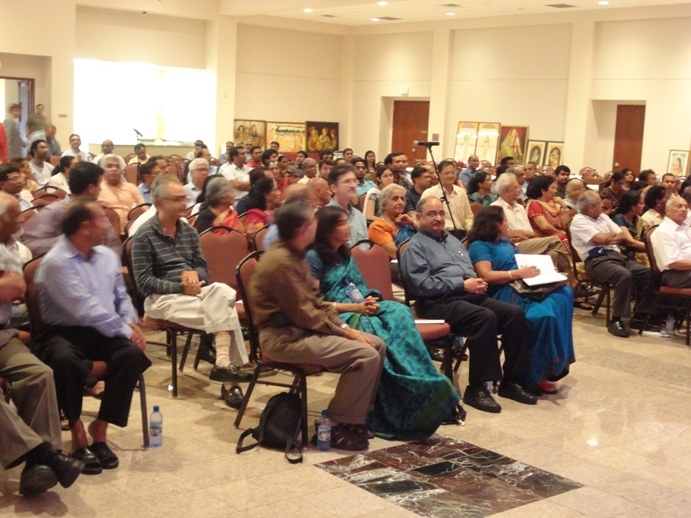 Dr. Swamy received a rousing welcome at a well attended public meeting where Mr. Pradip Parekh, Convener of HMSA’s Global Affairs Committee, introduced him to the people of Houston, hailing him as “Dharmaveer”, a title HMSA conferred on Dr. Swamy with an honorarium in the amount $2,000 to a wide acclaim. The title Dharmaveer was given in recognition of his longstanding service to the people of India that has seen him in a dogged fight in the supreme court of India against the astronomical loot of the national treasury by the current Indian government controlled by Sonia Gandhi and run by her appointees in the federal cabinet of ministers. (Picture: Dr. Swamy addresses the audience, while Mr. Pradip Parekh, Convener of the Global Affairs Committee of the HMSA looks on). The Indian govt has in recent months instituted a new tool c alled the “Participatory Notes”, championed by Mr. Chidambaram, where by this ill gotten wealth is brough back into the country with no questions asked, and finds its way into the inflationary real estate market, stock market and luxury goods. Dr. Swamy explained that 70pct of growth in the Indian economy is toward these “investments” and luxury go ods; the economic world of the common people remain largely high and dry, and hence the largescale poverty. 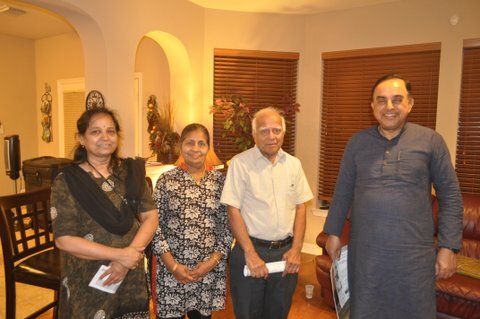 (Picture: Dr. Swamy is seen with – R to L – Shri Dilip Mehta, President of HMSA, his wife Mrs. Kusum Mehta, and Mrs. Aneeta Chakrabarty, former Chairperson of the HMSA Board of Directors). Corruption is the proximate cause of substandard goods and living in India. As bad as the 2G scam was (worth $40 billions), the coal mining scam is 3 times the 2G scam and the oil-field scam is 7 times as much. Dr. Swamy explained that if the wealth looted by the govt were to be rightfully restored to the national treasury, India would be one the most propserous countries in the world, and that no citizen of India would have to pay any taxes for years. 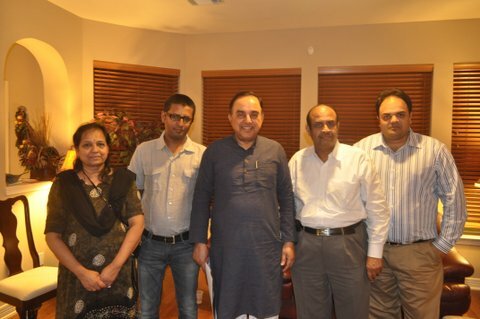 (Picture: From L to Right: Mrs. Aneeta Chakrabarty, an unidentified person, Dr. Swamy, Mr. Divyakant Parikh, Chairman of the Houston Chapter of HMSA, and Mr. Rahul Chandra, Secretary of the HMSA). Earlier, Dr. Swamy attended a private dinner hosted by and for the members of the HMSA. Hindu Mahasabha of America (aka Hindu Congress of America) observed Hindu Memorial Day on August 13th, 2011 at the India House, in Houston Texas. This event memorializes the millions of Hindu lives lost in various partitions of India, and during other pogroms of Hindus. The day long event was opened by Rudranath Talukdar who gave an overview of why the event was being observed and memorialized and the need for increased Hindu activism. The event was very well attended and almost doubled the attendance from last year with a standing room only crowd. Tapan Ghosh, a frontline Hindu activist from India spoke eloquently about the demographic changes occurring throughout a corridor between the Eastern and Western ends of India. He spoke of the native Hindu population being slowly displaced from the areas bordering Bangladesh by illegal Islamic migrants from that country. He stated that the portends for the future were dire indeed unless this vast demographic change was not countered. He said that Islamic militancy has been rapidly rising in these area and that this posed an additional area of alarm, not only for India but worldwide. Dr. Koenraad Elst, a world renowned Indologist and author delivered the first keynote address. 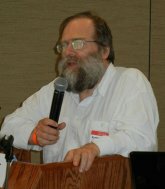 He drew on his vast knowledge of the inner workings of the Hindu movements within India and traced their origins and growth over the last many decades, and pointed out that for all their fulminations, mainstream Hindu groups had not really achieved very much in the last 80 or so years. This generated a lively discussion during the break between Dr. Elst and some members of the audience. As a part of the occasion, an essay competition for high-school students and college students was organized and the Shri Dwijendranath Sanyal Award for the first prize was given to Debomita Bhattacharya in high school category and Akshay Goswami in the college category. First runners-up was awarded to Aditya Dargan in the high-school category and Abhijana Bhatt in the college category, and the second runners-up was given jointly to Daksh Kapoor and Mallika Dargan in the high school category, and Sejal Lahoti in the college category. Dharmidner Dargan presided over the session titled “Activism in American Political System” in which an illuminating series of talks were given by three panelists, led by the young Rahul Nirmal, who explained how American Hindus can get involved in American politics, as well as history of those who have and are campaigning for public office. In addition, his speech also provided a brief primer of details of many U.S government positions such as eligibility requirements, as well as how to become involved as a voter once one becomes a U.S citizen. Finally, his speech provided details and tips on how to run for office. In short, his speech was quite informative and provided knowledge to help more American Hindus to be part of the American political system. Mr. Nirmal’s presentation was followed by Prof. Lalita Sen, speaking about political participation from the Democratic party perspective and then by Goray Mookerjee speaking from the Republican angle. The second keynote address of the day was delivered by Himani Savarkar, a long time Hindu activist from India, and a member of the famed Veer Savarkar family. She explained how the laws in India were twisted and configured to suppress Hindu’s and their political ambitions. She said that she found that it was easier to speak freely and without fear in the U.S.A. than in India. She left the audience with a call to action to get more involved in the political process in the United States. Finally, a well known Houson Hindu activist, Kem Acharya spoke. As a member of the Bhutan Hindu refugee diaspora, he spoke about the trials and tribulations faced by Hindus of Bhutan who were made refugees overnight in the supposedly peaceful and happy kingdom of Bhutan. He felt that coordination amongst and between various Hindu organizations was very critical in ensuring long-term well being of Hindus around the world. A lively panel discussion was then held and the audience participation in this was intense and involved. Most participants showed a keen knowledge and understanding faced by Hindu activists worldwide today such as being branded “fanatics” just for the crime of being an activist Hindu. The session was closed by the president of Hindu Mahasabha of America, Dilip Mehta, who asked all to observe a minute of silence for all the Hindu lives lost during India’s partition. He explained that when there is “adharma” (against natural order) and “anyaya” (against natural law), then it is incumbent upon Hindus to do as Lord Rama and Lord Krishna did and fight against it. He closed with a call to action, echoing the speakers before him. A vote of thanks was delivered to all the speakers who made it to the event. Expressing his agreement with the Tamil Nadu Chief Minister Jailalita, who characterized this bill as “fascist”, Mr. Parekh said that This bill is mischievously conceived in order to vest extraordinary dictatorial authority in the hands of central government at the expense of the state governments. The aims of GOI are transparent in that it seeks to unfairly topple the legitimate, duly elected state governments at will, specially the ones it does not or may not like, on the slightest pretext or even cooked up pretext of communal violence. Pointing to the well documented pattern of record of the Congress party, such as the infamous midnight atrocities perpetrated by the New Delhi authorities on the peaceful protesters asleep, he said that The anti-Hindu communal politics of the GOI is clear even to a casual observer of the Indian political scene. The hostility of the central government against the majority Hindu community is unprecedented in the independent India’s history; which is vividly clear from the periodic pronouncements of the Congress spokesmen, its abuse of the CBI and other GOI agencies in harassing, even beating up and torturing, various Hindu leaders and activists. He also noted that the current Congress government has been cited for colossal corruption numerous times. In fact, its own survival is predicated on corruption as has been obvious from the recent no-confidence vote at which wads of cash was illegally used to influence votes in favor of the government, a fact that is still under investigation. The corruption matters don’t get addressed, much less resolved, under current dispensation until extraordinary efforts are made by civic society led by such luminaries as Anna Hazare, Baba Ramdev, Dr Subramanian Swamy et al, and the Supreme Court of India must invariably intervene. Onserving the abuse of power by the GOI against the state govt in Gujarat, he said that the ongoing tussles between the GOI and some state governments is well known, as is the personal animosity of the GOI against some state leaders. The present bill would be unacceptable even on a good day. It is most certainly not acceptable under this malevolent regime of the Congress party when many state governments are showing extraordinary honesty, efficiency and progress while the GOI long remains mired in ungodly corruption and greed of power. He on behalf of The Hindu Mahasabha of America appealed to all parties concerned to present a concerted front in rejecting this undemocratic bill, and help frustrate the dictatorial aims of the corrupt regime in New DeMr. Pradip Parekh, Spokesperson and Convener of the Global Affairs Committee of the Hindu Mahasabha of America (aka Hindu Congress of America), on behalf of the organization, expressed his categorical rejection of the “Communal Violence Bill” as proposed by the Government of India of the ruling Congress party for a vote of approval by the Indian parliament. Mr. Pradip Parekh, Spokesperson and Convener of the Global Affairs Committee of the Hindu Mahasabha of America (aka Hindu Congress of America), on behalf of the organization, expressed his categorical rejection of the “Communal Violence Bill” as proposed by the Government of India of the ruling Congress party for a vote of approval by the Indian parliament. Observing the abuse of power by the GOI against the state govt in Gujarat, he said that the ongoing tussles between the GOI and some state governments is well known, as is the personal animosity of the GOI against some state leaders. The present bill would be unacceptable even on a good day. It is most certainly not acceptable under this malevolent regime of the Congress party when many state governments are showing extraordinary honesty, efficiency and progress while the GOI long remains mired in ungodly corruption and greed of power. He on behalf of The Hindu Mahasabha of America appealed to all parties concerned to present a concerted front in rejecting this undemocratic bill, and help frustrate the dictatorial aims of the corrupt regime in New Delhi. Mr. Pradip Parekh, Convener of the Global Affairs Committee of the Hindu Mahasabha of America(aka Hindu Congress of America), on behalf of the organization, expressed condolences and support to the valiant and resourceful people of Japan in their hour of need in the wake of catastrophic earthquake and tsunami. 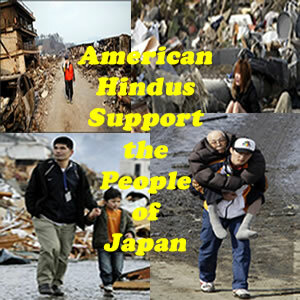 American Hindus shall join in the worldwide organized effort to do their part to help those affected in Japan, and pray that Japan will be expeditiously restored. Mr. Parekh recalled the role played by Japan in India’s freedom struggle in its support to Netaji Subhash Chandra Bose and Rash Behari Bose and the formation of Azad Hind Fauj (Indian National Army). It was the Naval revolt, which in turn was inspired by the INA and leadership of Netaji, that played a decisive role in British colonialsts granting India its freedom. Mr. Parekh further added that American Hindus can pay the debt to the people of Japan by generously donating to the relief effort. He further recommended on behalf of the organization thatAmerican Hindus use the the following charities that are active in the relief effort in Japan. The Hindu Congress of America is deeply concerned at the reported remarks of Governor Robert Bentley wherein he is reported to have told a group at a Church gathering, right after his inauguration that. “If the Holy Spirit lives in you that makes you my brothers and sisters. 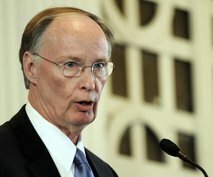 Anyone who has not accepted Jesus, I want to be your brothers and sisters, too,” Bentley said. We ask the Governor to repudiate his statement and also ask the Republican National Committee to do the same. 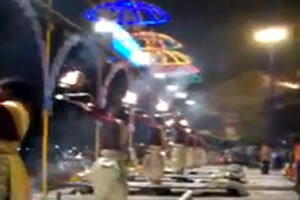 December 10, 2010 – Hindu Mahasabha of America has strongly condemned the horrendous bombing of a Hindu place of worship in Varanasi, India on December 7, 2010 where an inf ant was killed and dozen’s injured. 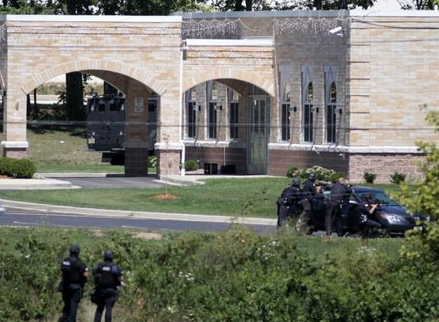 A terrorist organization, the “Indian Mujahideen” has claimed responsibility for the attack and in e-mailed comments to many news organizations, promised to commit more such crimes. 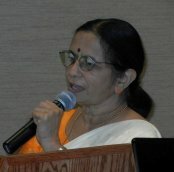 Rudranath Talukdar, spokesperson of the organization, expressed the anger of the American Hindu community by saying that this is the 4th bombing attack in Varanasi in the past five years and till date the Indian government has been more keen on rhetoric and less diligent in seriously pursuing terrorism in India. Dr. Talukdar demanded that the government of India vigorously pursue the perpetrators and bring them to justice.